An acupuncturist is a complementary health practitioner who takes a holistic approach to the maintenance of health and the management of disease, with a focus on improving overall well-being. Acupuncture is an ancient form of traditional Chinese medicine based on the theory that the body depends on life energy, known as qi, being in balance. Employing treatment methods such as needling, acupressure and herbal medicine, acupuncturists stimulate the patient’s energy flow in order to relieve symptoms and restore the body’s natural balance. Acupuncturists treat patients suffering from musculo-skeletal, respiratory and circulatory, gastrointestinal, gynaecological, neurological, and stress-related disorders, and pain and allergies. Their day-to-day work includes: taking a detailed history from patients; talking about issues surrounding their symptoms, such as lifestyle, diet and emotions; diagnosing and deciding what action to take; selecting specific points on the body to be treated; inserting needles according to the level of stimulation required; keeping records of treatment given to each patient. Why did you choose this profession? My family is well known in medicine and has been for generations. My father encouraged me to study acupuncture and Chinese medicine when I was young. As the son of one of the most respected acupuncturists in Cape Town, I have been able to learn a lot of unique and different acupuncture theories and techniques. What do you enjoy most about your work? I like to see people happy and living without pain. When I help someone with a problem, I feel happy. After more than a decade of practicing acupuncture and Chinese medicine, I am still thrilled and amazed with the outstanding results of these healing arts. Are there aspects of your work that you don’t enjoy Sometimes people expect miracles from one treatment. Miracles can happen, there is no doubt about this, but, in most cases, repetitive treatments are necessary. The body takes time to adjust itself to new patterns and new ways of being. Generally speaking, the longer the condition has been present, the longer it will take to adjust. People can be impatient, with far too many constantly jumping from one therapy to the next without giving any of them a chance to work. Those who expect a quick fix will be disappointed. Those who stick with the treatment have a better chance at success. What hurdles have you had to overcome? In South Africa, most people only consider having acupuncture when they have tried everything else and failed. A fear of needles discourages people from trying acupuncture. Your career highlight to date? Gaining the trust of my patients is an important component of building my practice. Patients who trust me will not hesitate to rebook appointments, or come back to me when some other health problem arises. Also, patients who trust me are willing to refer their friends and family members to me because they’re confident that their loved ones will trust me too. That’s why the Dr Lin Acupuncture Clinic has lasted and has provided healthcare to the communities of Cape Town for over 25 years. What are your future goals? My goal is to free my patients from symptoms and help them stay well; for them to be symptom free and even medication free. In your line of work, is experience as important as formal training? Chinese medicine and acupuncture are both based on theoretical foundations and clinical experience. Accumulated experience helps practitioners to be more sensitive and observant – able to read symptoms and identify problems. It’s also important to keep up to date with the latest medical findings and research. Describe your job in three words Knowledge, experience and compassion. A basic practical knowledge of acupuncture techniques and philosophy is essential for practising as an acupuncturist. Most acupuncturists have a qualification that is recognised by one of the professional organisations for acupuncture. 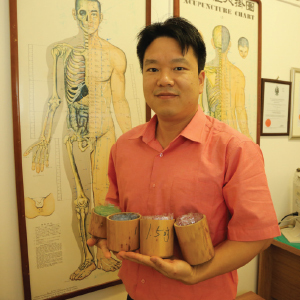 Aspiring acupuncturists may also gain training through apprenticeship programmes. These programmes provide apprentices with practical experience under the guidance of an experience acupuncturist. Once you are on a course leading to membership of a professional body, you will combine practical work placements with studies at university or college. Throughout your career you will need to keep your skills and knowledge up to date. You could achieve this through membership of one of the professional bodies which would give you access to a programme of Continuing Professional Development (CPD).